We’d love your help. Let us know what’s wrong with this preview of Her Blackened Soul by Isra Sravenheart. “I'm Lady Isra, the most ferocious villain in the land or so I hear. The people say a lot about me. They say I am heartless, cold and wicked. But they don't know what made me this way. I lost love becoming trapped in the throes of darkness." “But now I've met him. This magnificent being. He's a raven. I can't help but admire him. Astrid, now what a handsome fellow. I don't know where he will take me but I'm curious to step into his claws." To ask other readers questions about Her Blackened Soul, please sign up. Reading this book took me back to when I used to read fairytailes. It caused you to use your imagination and take you away into the world of where the book is trying to place you. This was an enjoyable and pleasant read. I received this book in a recent Goodreads First Reads giveaway. This is not a genre that I would usually read, but am always ready to try different books from my norm. The book was enjoyable and may read more by this author. I rarely write what a story is about for fear of spoiling for others, but I would recommend giving this book a go if you enjoy this genre. 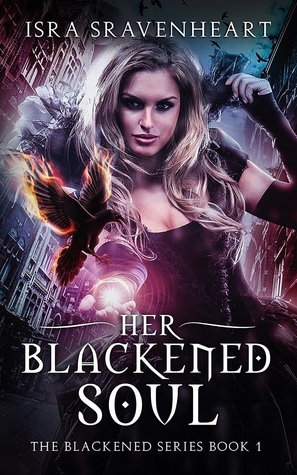 This book lives up to its title of a blackened soul, and just when you think maybe she can be redeemed the witch will show you just how much she enjoys having a black heart. The book can be a bit repetitive in saying just how black of a heart the witch has and repetitive in her claiming how much punishment/revenge she will give long before she finally does give it. Though I thought maybe the ending final punishment would be what it was, I was a bit surprised the last punishment wasn't worse cons This book lives up to its title of a blackened soul, and just when you think maybe she can be redeemed the witch will show you just how much she enjoys having a black heart. The book can be a bit repetitive in saying just how black of a heart the witch has and repetitive in her claiming how much punishment/revenge she will give long before she finally does give it. Though I thought maybe the ending final punishment would be what it was, I was a bit surprised the last punishment wasn't worse considering all that had gone before. The worse part was what happened to poor Astrid the raven in my opinion (to say more would spoil it), and for that it made me really not like the witch Lady Isra at all...though luckily that was at the very end of the book. There were a handful of glaringly obvious miswrites in sentences (parts where you can see the sentence begins one way and then ends in a different direction, making the middle more muddled--though it is only a handful of times). Also just a few poor word/phrasing choices that jump out as you are in the story and pulls you out of the story to notice them instead (almost like when people's smart phones decide to change your words to something totally different and the text is sent before the sender sees it). Example: page 151: "Their conversation went on for a while before Lady Isra went out for a walk, she had some things to take of she said but there was no clue of what she had meant by this." Obviously it should of said: ...some things to think of.... .
As for plot holes, who killed the snake? Where did the angels go? Was it the angels killed the snake in hopes of making Lady Isra think it was Astrid and get her to hurt him as well? Was it whoever had mysteriously hurt Lady Isra in the past to cause her heart to turn black to begin with? Was it Lady Isra herself to test Astrid in whether he would tell her or not, and if so why act like she didn't know, and if she she didnt know why no care to find out who did it since she still thought him friend? (no revenge for her friend then, just revenge for herself and other wronged females sort of then?) How did Kane's gypsy seer family not see what was happening to him or to be wary of Lady Isra and friends? Where did Lady Isra go at the end of the story and more importantly why? *seriously after so much talk of plans and plans for revenge, with no actual plan telling, why no talking of the after plan at all? * How can it be said back to back: stated person has control over another person, then no one knows of the controlled person's health or actions for days, then obviously controlled person is alive and kept alive because that is part of the plan. ???? Some of the logic in this book is totally not real logic, that is all you need tell yourself in order to keep reading and get to the end and discover the after plan that was never mentioned. A fantastic dark story ! I really enjoyed reading about this Black Witch that had no mercy or regret.regrets. She lives hidden from human eyes only speaking with the animals. One day a human visitor enter her sort, something he's gonna regret the rest of his life. A raven shows also up and some really strange happened that shows no matter who you are someone is capable of loving you. Lady Isra is a witch with a blackened soul which makes for one very wicked witch. Lady Isra met a python in the woods and they became friends. Romeo warned her of a man who would approach her seeking help. She set forth a plan for this man and his destruction. Lady of the Dark, Isra, hates humans especially the weak ones. Humans who have a strong spiritual gift of feelings and emotions for one another. She has no one she can trust. When Kane approached Isra seeking help, she gave him two options Lady Isra is a witch with a blackened soul which makes for one very wicked witch. When Kane approached Isra seeking help, she gave him two options. He was now her slave and a prisoner of her hidden kingdom. Will she kill him or will he change her heart? Her curious nature, about the worthless humans, sends her on a trip, in disguise, to the nearest village. There she meets Lillian, Kane's fiancee. Does Lillian change Isra's views about humans? Astrid, a raven, is Lady Isra's closest friend and confidant. He is her eyes and ears to protect her. What is Isra plan for Astrid? Who will betray the Lady of the Dark with a blackened soul? The author sends us on a journey into a fantasy, paranormal world of evil and destruction that keeps you intrigued from the very beginning. DISCLAIMER: I have received this book for free through the Goodreads giveaways. I always read all the books I win, simply because I like to be thankful for having the chance to read for free. This is my sign of appreciation towards the author who took time out of his/her life to create something. Saying that, I simply could not get past page 50 of this book and after that just started reading a few paragraphs every other page. My eyes might have been bleeding at one point and my brain definitely s DISCLAIMER: I have received this book for free through the Goodreads giveaways. Saying that, I simply could not get past page 50 of this book and after that just started reading a few paragraphs every other page. My eyes might have been bleeding at one point and my brain definitely short-circuited several times. I found the book quite hard to get into and slow to start but after getting about half way through I started to enjoy it more. I found that there were a lot of grammatical errors in the version I received and words in the wrong order which sometimes made it hard to follow what was going on. The story ended very abruptly I thought. Can love truly save us? This is a story of revenge and love. Isra wants revenge on Human kind for how they treated her. She has slain Dragons and has more dark magic then anyone else. But only two friends. A snake named Romeo and a Raven names Astrid. Kane is a simple warrior with the power to see. He seeks out the Dark Lady and asks for a favour, he is turned into her slaveand looses so much, starting with his freedom and ending with death. Astrid loves Lady Isra and will do anything for her. Even allow the Lady to make the transformation froM Raven to Human. This story has a very slow start and was difficult to get into, but on I got into the story the pages seemed to turn the,selves. Magic, blood, power, and love. Though not the mellow love story you usually encounter. The beginning was a bit slow,but once the story picks up it's pace you really enjoy the read. Our female protagonist, Isra, is a powerful witch consumed by darkness, and unapologetic about it wich makes her refreshing. In fact the entire story is refreshing, told from an entirely different point of view that would make you question your moral compass. The descriptions are beautifully made allowing you to enter Magic, blood, power, and love. Though not the mellow love story you usually encounter. The beginning was a bit slow,but once the story picks up it's pace you really enjoy the read. Our female protagonist, Isra, is a powerful witch consumed by darkness, and unapologetic about it wich makes her refreshing. In fact the entire story is refreshing, told from an entirely different point of view that would make you question your moral compass. This book kept me up all night while the rain was fall. Isra different from most she is well know for crafts and people will pay her well for it. She use her craft very well. She keeps to her self and don't let anyone stop her from her growth. A wonderful read on a rainy day. This was my first book by this author. I loved this book because it was from any other urban fiction books It have been reading. I love the concept of love and revenge all in the same book. I will definitely try to find more books like it. Lady Isra was just evil. I like how I could imagine everything like it was a movie playing in my head. I can't wait to see what the next book has in store. This is the story of a truly evil witch. She studies her craft to become more evil and powerful. Why does she hate the humans. She is cunning and sly. She captures a young man and psychologically tortures him until she leaves him with no hope in his heart. Read this captivating story to discover how evil a witch can become. A good story of a young witch who goes over to the dark side. Lady Isra of the Dark is very DARK. Don't believe me she'll tell, over and over again. Being an attentive reader I did not need the frequent reminder. I would have rated it higher if that was fixed. All in all it is a good and evil tale that holds your interest. I gave this book five stars because I felt like I was part of the story.I normally only read King,but I was not disappointed.The author has me hooked and I will be patiently waiting for more of her work.Fantastic. I can honestly say this is my first book of this kind. It was interesting, but I think I'll pass. Lady Isra was one cold hearted woman who I wouldn't want to cross paths with. Just thinking about the thinks she was capable of had goosebumps going up my arms. It seems as if Kane is quite naive; though at times he can be noble as well. There were times when there wasn't a lot that happened in this novel. I got a copy in exchange for an honest review. I enjoyed this book. But it was hard to follow in some spots and seemed to repeat itself in others. It was different and it kept me engaged throughout the whole book. The cliff hangers and twists had me going as well. Definitely a recommendation for those who like the genre. She resides in the UK and loves spending time with her cats! You can stalk Isra on social media and find out Isra Sravenheart, USA Today bestselling lives in a fantasy world while writing elements of life and love into her books. Digging in the dark fantasy realm, her preferred area is creating villians that have hearts but she loves a good hero/ heroine. Dragons, witches and ravens are her forte!